Mr.Lite is a manufacturer with a broad selection of lights, here I am taking a look on CR123/LiIon light with two different drives. The light has the (manufacturer) programmable user interface and this time I asked to get a custom programming. The light always start at the same setting, presses on the switch will cycle through the different settings. I received only the lights, no box or accessories was supplied for the review. 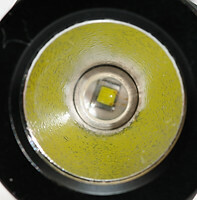 The light has an OP (Orange peel) reflector with a Cree XR-E led in the center. 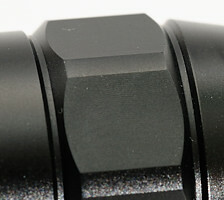 The head of the light has no knurling, but has some squares that prevent the light from rolling (That is not really necessary, because the body also has an anti-roll shape). 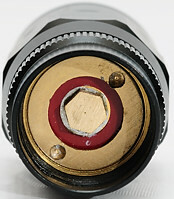 Looking into the backside of the head shows the battery connection with a solid construction. This is the pill, that exists in different versions for LiIon and CR123 batteries. 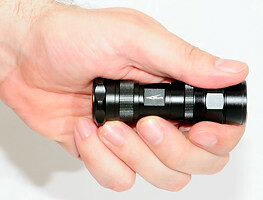 The body is rather short, because it is an CR123 light and has no knurling on it. 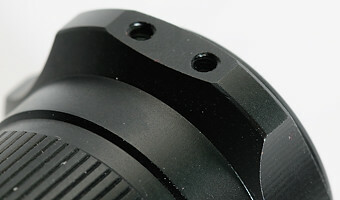 The treads are anodized and makes lockout possible. 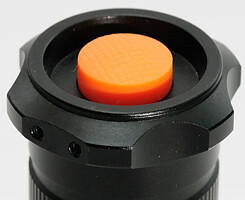 The tailcap has some knurling and the anti-roll backend with holes for mounting a clip. 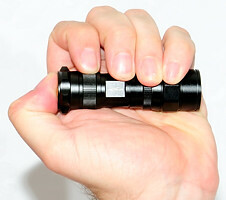 Because the body of the light is thinner than the front and backend, the light is easy to hold secure. 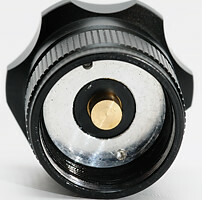 The inside of the tailcap has a spring with a cap on for connection to the battery. 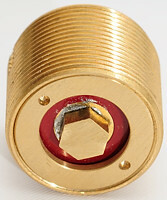 The switch is a reverse switch, beneath the typical rubber boot. Here is the complete light with all parts it can be dismantled in without tools. The standard user interface has lots of settings. Medium 30%: General purpose usage, this setting is fine for most of lightning needs. As low as possible: When I want a very long runtime or just a low brightness. As bright as possible: Sometimes I also need as much light as possible. 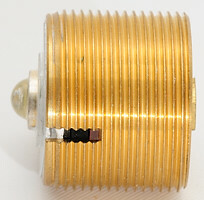 Slow strobe, around 5 Hz with 60% pwm: This strobe can be used for warning or marking purpose. Beacon, 0.1 second flash each 2 second at full power: For marking, has a very long runtime and can be spotted from a long distance. I did not get exactly what I asked, but something close and I believe very useful, see the technical analysis. People that do not like the standard settings or my selection, can just order it with their own selection of modes and brightness settings. I like the possibility to order it with a custom defined user interface on this light, getting a light with the perfect settings is a big plus. The construction of the light is solid and the driver keeps the brightness fairly stable. 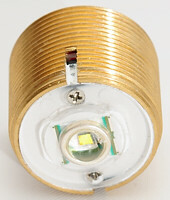 The light can be bought with different drivers for LiIon and CR123. The LiIon driver will shut down the light when the battery is empty, i.e. it can be used with unprotected batteries. Weight: 103.3 gram with LiIon battery. 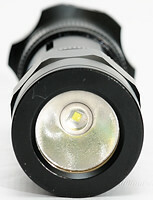 The light uses a Cree XR-E led. The standard programming on this light has 5 brightness settings and 4 flashing modes, for measurements with that kind of driver programming, see some other MrLite review (SS2, LT2, KC-05). This light has a custom programming with 3 brightness settings and 2 flashing modes. This table is for the LiIon driver. There are no specified values, because my levels are custom programmed. For the brightness I used a luxmeter and then scaled the values, the pwm is measured with my oscilloscope and a light sensor, the current with my DMM on peak/average (Fluke 289). 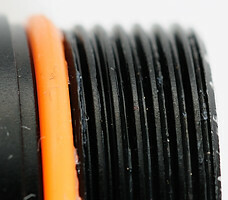 For the estimated runtime I have take the current measurements and divided into 600 (i.e. a 600 mAh battery), this is a very rough estimate. PS: The , in the table is a decimal point. Doing a voltage sweep with the LiIon driver shows that the light has a rather peculiar characteristic, it has maximum brightness at around 3.7 volt. This can also be seen in the runtime curve, the brightness will increase while the battery is drained and then start dropping. The high brightness setting shows the raise in brightness that was also seen with the voltage sweep, the medium setting has a stable brightness and long runtime. The brightness is controlled with pwm at 290 hz with some smoothing, the above trace is the low brightness. High brightness, the light does not reach a fully 100% at full brightness. The strobe is 2.2 hz with 50% duty cycle. The beacon is a 0.1 second flash each 1.6 second. For beamshots and comparison to other light see here. 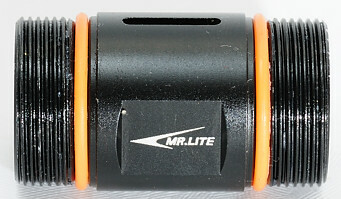 The light was supplied by Mr.Lite for a review.